SPARTANS and Hibernian have agreed to end a landmark arrangement which had seen the Lowland League side and the Championship club combine resources to help develop the next generation of promising young footballers. The Transition Academy has only been up and running since last summer but, less than 18 months into the collaboration, the clubs have agreed to go their own way in terms of youth development. At the time is was hoped that the clubs could implement a more holistic approach to creating a player pathway, allowing young players to enjoy elite football in a supportive environment and graduate from the Transition Academy better equipped for life, education as well as an appropriate level of football participation. 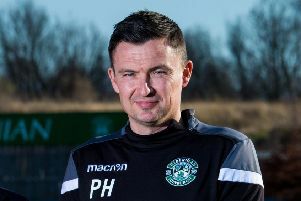 The intention was to implement a structured and consistent approach, utilising the quality facilities at Ainslie Park as well as Hibs’ training ground at East Mains, to develop highly skilled, flexible footballers but the partnership has not worked out. Hibernian were unwilling to comment yesterday but, at the time, chief executive Leeann Dempster said: “Hibernian is delighted to have agreed this collaboration with Spartans which rightly enjoys an unrivalled reputation for the extraordinary success of its community and grassroots football work, and for all that it does to develop young footballers from an early age. The initiative, administered by a joint board, focused on the most promising eight-11 year olds identified by coaches from the two clubs and it was the intention to extend the arrangement as those youngsters grew older. But with things failing to go as planned, the arrangement will now come to a premature conclusion at the end of December.